Some interesting data was published a couple of days ago on the subject of how migrant voters could influence the outcome of the election. A report by the University of Manchester and the Migrants’ Rights Network suggested that almost four million foreign-born residents of England and Wales will be eligible to cast a vote on 7 May. 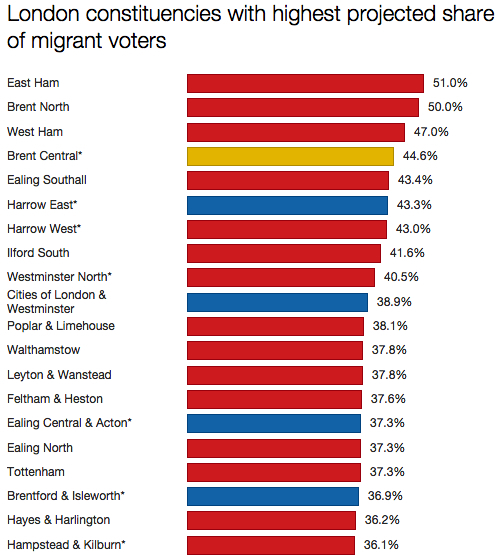 It also identified two constituencies with the potential for a majority of voters to have been born overseas: East Ham and Brent North. Most of the top 20 are safe Labour seats. The three Labour marginals, Harrow West, Westminster North and Hampstead & Kilburn, should all be held by Labour at the election. But the four other marginals – three Tory seats and one Lib Dem seat – are Labour targets. I expect them all to change hands, and it will be fascinating to see to what extent the demographic of each constituency has an impact on the result. As you can see, only three of the 20 are held by a party other than Labour. One, Bradford East, will almost certainly be won by Labour from the Liberal Democrats, while Bradford West could well slip from the grasp of George Galloway and move back into the Labour column. Only Reading East is likely to remain a non-Labour seat. It’s not a marginal at the moment, but again it’ll be interesting to see how the demographics of the seat influence the result. I suspect Reading East could well become a marginal in the near future.